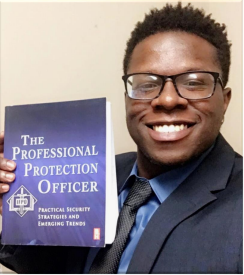 Miles Ellington, a student attending Alcorn State University, was recently awarded a scholarship to attend the Initial Security Officer Program (ISOP) course and a copy of the 8th edition of the IFPO's The Professional Protection Officer. During a recent interview of 19 students at Alcorn, IFPO Board Member Ron Martin, CPP, CPOI was so impressed with Miles' potential in the security industry that he recommended the scholarship to IFPO Executive Director Sandi Davies. In addition to his scholarship, Miles will receive two sponsored student memberships: One to ASIS International, the largest worldwide organization consisting of over 35,000 members and the other to the Security Industry Association, which represents more than 800 security manufacturers and system integrators.